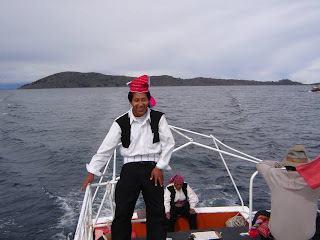 Photo: Delfin on the boat dressed in traditional clothing with Taquile Island in the background. Taquile is incredibly beautiful with terraced fields, views across the blue Titicaca lake water of the Bolivian snow-capped mountains, and skilled fiber art. Plan to stay at least one night. Plan also to buy tejidos (textiles), either from the artisan's cooperative or directly from your host or other family. This weaving is among the best in the world, very fine double warp patterns. Your purchase helps keep the technique and the villagers alive. From the city of Puno, Peru, ignore all the tour guides (this won't be easy) and catch the turquoise topped communal boat to Taquile Island by going to the Puno Port at 7:30 in the morning. Taquile has the first office on the left as you arrive at the port. Look for the men dressed in traditional Taquile garb: black trousers, white shirt, black vest, red hat, and red or white cummerbund. It's cheaper than the guided tours and more fun because you ride with local people. Recent regulations have denied the Taquile community the control over tourism that they used to have when ALL the boats allowed to dock on the island were communal Taquile boats. The tour boats don't pay the locals anything and are rather unkind about not letting them ride on the boats. After the 3 1/2 hour boat ride, you arrive on the East side of the island, so avoiding the famous five hundred-stair hike up to "the arch." You'll hike down those stairs for the return boat to Puno. STAY OVERNIGHT IF YOU CAN! Ask to be assigned to a host family. Rooms are basic: clean and with plenty of blankets; currently the community certifies the tourist comfort of the rooms. Bring fresh fruits and vegetables from Puno as a gift to share with your host family; you can buy lunch from them. Note, once you get up he hill you'll be at nearly 13,000 ft or over 3800 m., so be sure to take it easy and drink plenty of fluids. Although many restaurants have opened in recent years, we recommend the communal restaurant on the east corner of the central square in the pueblo. Families rotate turns running this restaurant; menu is fish and a very flavorful soup. Greetings from the UK! I enjoyed reading your blog and your journeys as "godparents of that communitiy. I love that godparent role. Carole and I have journeyed to a remote village in Bangladesh for 18 years now.....and yes....we could now think of ourselves as godparents! Among other initiatives, we are slowly introducing solar cooking. We just returned from our latest trip 2 weeks ago. If you wish, I could send you a couple of photos etc? Thank you on travel advice. I hope to get there next year. Would you also post some photos of the local textiles and perhaps describe how they are different from others in Peru. The textiles are different because they are so very very fine. They will UNply purchased loose three- ply yarn, and respin it to a very tight thread to weave into richly figured belts and bags. As our trip progresses, I'll see about posting close up pictures of these weavings. Even the men's knitted work is often very tight stitching and figured, in contrast to the loose work of much of Peru.